What initially got me onto the topic of collapse was Dr. Jem Bendell’s paper on Deep Adaptation: A Map for Navigating Climate Tragedy – here’s his introductory post. Dr. Bendell is a Professor of Sustainability Leadership and Founder of the Institute for Leadership and Sustainability (IFLAS) at the University of Cumbria (UK). [The] evidence is mounting that the impacts [of climate change] will be catastrophic to our livelihoods and the societies that we live within. Our norms of behaviour, that we call our “civilisation,” may also degrade. When we contemplate this possibility, it can seem abstract. The words I ended the previous paragraph with may seem, subconsciously at least, to be describing a situation to feel sorry about as we witness scenes on TV or online. But when I say starvation, destruction, migration, disease and war, I mean in your own life. With the power down, soon you wouldn’t have water coming out of your tap. You will depend on your neighbours for food and some warmth. You will become malnourished. You won’t know whether to stay or go. You will fear being violently killed before starving to death. You can find more information on Deep Adaptation here. We’ve gambled too much on succeeding in preventing or mitigating anthropogenic dangerous climate change and the anthropogenic extinction crisis. Because we were unwilling to face up to the alternative. But the alternative is not as simple as an instantaneous end of life would be. The alternative is complex, involving many possible variants of ‘unthinkably’ horrendous, bad, and even good. Most crucially: there is a huge difference between the various versions of complete irrecoverable societal collapse, on the one hand, and the rise of a successor civilisation(s) out of the wreckage of this one, on the other. We have to be willing to think this. And face it. Or it could be worse even than that; it could be the elimination of virtually all complex life except extremophiles. Why could it be as bad as that? Because if something like the methane dragon really does start to fly and causes a runaway effect there is no knowing how how much it will go on. There isn’t very good reliable science on this but some scientists think that it could push up global temperatures by at least something like 12 degrees. The heating might not stop at all. I think it’s obvious that total collapse has to be avoided and it doesn’t hugely matter when you drill down within it which version of it you have. But it still does matter a bit; for instance, it would (for more than one reason) be much much worse for us to exterminate all cetaceans as well as ourselves than it would be for us just to exterminate ourselves; above all, because doing the former would render it less likely that a new species would be able to come along after we were gone and do a better job of creating a culture that can last. I used to think that no matter how bad us humans end up pushing climate and ecological breakdown, up to and including human extinction, there will still remain a Planet Earth with meaningful life afterwards. Now, I am less convinced. For a long time, I’ve wrestled with saying something, saying nothing, not saying enough. I’ve always been terrified of standing up, being looked at, being judged. I still am. Right now, I don’t know what to do other than write. Write out my grief, my anger, my fears. Write this: we are killing our world. This is not emotional hyperbole. This is fact. It’s a fact I’ve been too scared to look at, eye to eye, for a long time because it’s paralysing. Political conflicts have reached such a state of social distress that we are not even able to rescue the most fragile among us, those fleeing their homes because of war and climate change. So many people around me feel desperate when looking at the constant stream of unpleasant, alarming news which has become our daily burden. I sometimes see glimpses of an Earth at its climatic tipping point, where just a few degrees more would make modern agriculture impossible, endangering the whole food industry. I see glimpses of street fights, of empty shelves in supermarkets, of rations and global panic. What will our lives look like when a liter of petrol costs 8, 9 or 10 euros? Which perspectives will remain when we are unable to maintain public services or when hospitals cannot function due to human or infrastructure failures? Once in a while, and with increasing frequency, climate change rises to the forefront of popular consciousness. It happened, for instance, in 2007, when An Inconvenient Truth won two Oscars and extreme heatwaves swept across the US and Europe, causing wildfires that torched over ten million acres of forest. A critical mass of people aided by the notion that others are doing something similar can break through the powerful psychological resistance and look the blinding thing in the face. It’s devastating and painful; you grieve and you panic. Even so, there’s relief in bringing something so painful into view, in holding it with your mind. But you can only look for so long. Resistance reasserts itself, and you slide back behind it. Next time you come out a tiny bit further before you retreat. This is how understanding happens, through a series of breakthroughs and retrenchments and consolidations, as with all efforts toward intentional growth. A single revelation is rarely enough. Even though “we know, we know,” as Bellow’s Mr. Sammler says about the human moral impulse, we also forget, forget. Over most of the last decade now, I’ve watched celebrations of the New Year become more and more muted, and I think it’s far more likely than not that this trend will continue when 2018 gets hauled off to the glue factory a little less than a week from now. No doubt plenty of people will be glad to see it go, but any enthusiasm engendered by that departure will be mixed with, if not swamped by, uncomfortable thoughts about what 2019 will bring in its place. 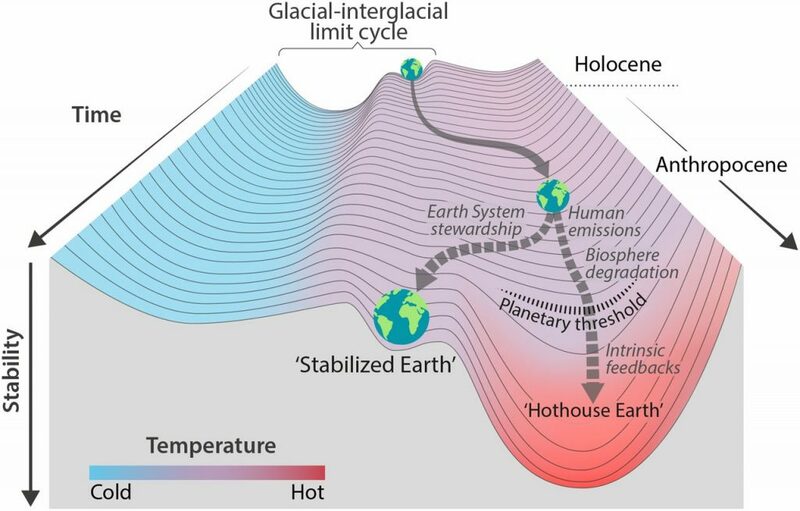 Trajectories of the Earth System in the Anthropocene or the ‘Hothouse Earth’ paper was one of the more cited and shared scientific papers on climate breakdown in 2018. It is a good explanation of the little-understood feedback loops in the Earth System and the potentially catastrophic risks of cascading effects. The Guardian published an interview with one of the authors, Hans Joachim Schellnhuber, in August: World is finally waking up to climate change, says ‘hothouse Earth’ author. We may be waking up but we remain paralysed. I also spotted Leo Murray’s excellent short film Wake Up, Freak Out that covers themes that are virtually identical to the ‘Hothouse Earth’ paper. Shockingly, this short film was produced in 2008. We have made no progress in ten years. In fact, things have gotten much worse. Over the last two decades, discussions of climate risk have been strongly influenced by concerns about moral hazard. The suggestion that human societies might successfully adapt to climate change, the argument goes, risks undermining commitments to cut emissions sufficiently to avoid those risks. But moral hazard runs the other way as well. On a planet that is almost certainly going to be much hotter even if the world cuts emissions rapidly, the continuing insistence that human societies might cut emissions rapidly enough to avoid dangerous climate change risks undermining the urgency to adapt. Adaptation brings difficult tradeoffs that many climate advocates would prefer to ignore. To me Nordhaus’ observations ring true. There is severe risk in pinning misguided hope onto some as-yet non-existent future technology and delaying or avoiding large-scale efforts (and tough negotiations) on reduction, mitigation, resilience and adaptation because of that. We continue to live in denial. Please read this excellent COP24 piece by Kevin Anderson, too: Capricious foes, Big Sister & high-carbon plutocrats: irreverent musings from Katowice’s COP24. The climate is breaking down. It’s urgent. An emergency. We’ve only got a few years left to ‘fix’ it. I’m here to say that XR isn’t about the climate. You see, the climate’s breakdown is a symptom of a toxic system of that has infected the ways we relate to each other as humans and to all life. This was exacerbated when European ‘civilisation’ was spread around the globe through cruelty and violence (especially) over the last 600 years of colonialism, although the roots of the infections go much further back. Meanwhile, Big Oil keeps expanding in the Permian Basin in Texas and New Mexico: OPEC’s Worst Nightmare: Permian Is About to Pump a Lot More. Science and reason have no effect on these activities. The following two articles are examples from the more negative end of the spectrum of how industrial civilisation might collapse. I am including them here as illustrations of speculative scenarios; a tool I feel we should be making more use of in painting prospective visions of how the next several decades might unfold – and how we might collectively influence this unfolding. In a growth-less, contracting economy, the profit motive can have a powerful catabolic impact on capitalist society. The word “catabolism” comes from the Greek and is used in biology to refer to the condition whereby a living thing feeds on itself. Thus, catabolic capitalism is a self-cannibalizing system whose insatiable hunger for profit can only be fed by devouring the society that sustains it. As it rampages down the road to ruin, this system gorges itself on one self-inflicted disaster after another. We’ve tied ourselves in a perfect Gordian knot. The global economy is a vast machine, operating beyond the control of even the most powerful individuals, and it has a will of its own to consume and pollute. It’s hard to believe that this massive metal beast will be peacefully undone by the people who survive by it, and we all survive by it in some way, often against our wills; it bribes and entraps us all in ways large and small. But a wrench could clog the gears, and maybe only a wrench can stop it. One wrench that could slow climate disruption may be a large-scale conflict that halts the global economy, destroys fossil fuel infrastructure, and throws particulates in the air. What we do know is that humans can survive and recover from war, probably even a nuclear one. Humans cannot recover from runaway climate change. Nuclear war is not an inevitable extinction event; six degrees of warming is. This list of essays and articles on climate and ecological breakdown and collapse is by no means exhaustive. I have hundreds of mainstream media articles filed under ‘bad news’ but chose not to include those here – all you need to do is read the news on any given day to get a solid feel for the destruction of our planet. Please don’t look the other way any longer. Please wake up. Then act. The content below has been added after the original publication of this article. Reporting on the catastrophic impact of climate disruption for this book involved trips to the front lines of collapsing geo- and biospheres and interviews and reports about near-apocalyptic scenarios: about rapidly thawing permafrost, the release of methane into the atmosphere, the flooding of coastal cities, the increasing likelihood of billions of people dying in the not-so-distant future. Though I learned to find a way of looking unwaveringly at what was happening to the planet, I fell into a deep depression and I began to wonder whether there was any point in even writing about this. – Tere Vadén (in Finnish): Miten rationaalista on ajatella, että suomalaisen elinkeinoelämän kilpailukykyä ei pidä heikentää ilmastonmuutostoimilla? Climate change means some bleak prospects for the decades ahead, but I don’t believe the appropriate response to that challenge is withdrawal, surrender. I think you have to do everything you can to make the world accommodate the life you want to have for yourself, and your family, rather than giving up early, before the fight has been lost or won, and acclimating yourself to a dreary future brought into being by others less concerned about climate pain. The fight is, definitively, not yet lost — in fact will never be lost, so long as we avoid extinction, because however warm the planet gets, it will always be the case that the decade that follows could contain more suffering or less. All of the above begs the question: could mankind have avoided this, the ultimate tragedy? The answer, unfortunately, is probably not. Oh, I’m sure something could have been achieved way back in the 1970s when the oil companies suspected, or knew, their product was warming the planet. Maybe even in 1988 when some chap called Hansen, if my memory serves me well, warned the US Congress of the consequences of temperature rise. By 2000, or 2010 it was all probably too late. But if we, mankind, had collectively given up all fossil fuelled vehicles world wide around those dates, perhaps. But, as we all know, there never was a possibility of that happening. The feeling of entrapment within the smoke, the coughing and wheezing while trying to breathe, the primal urge to escape it, all underscored to me how dire our situation is globally. Arriving back home, out of the smoke, I thought of future summers. Even up here in the verdant Pacific Northwest, wildfire smoke will be the norm. Yet, compared to those who’ve already lost their homes to the fires, or those who’ve had everything they own submerged by storm surges from hurricanes, or refugees fleeing war-torn countries destabilized by drought and climate disruption impacts, smoke inhalation is a minor problem. Such is the climate-triage of our new world. Ken Avidor‘s climate fiction ‘Mazz Alone – A story about Abrupt Climate Change’ (23 min) is chilling. For background, please read Douglas Rushkoff’s Survival of the Richest. This kind of climate breakdown future is absolutely not preferable, hopefully not plausible, but unfortunately possible.